It’s come to my attention that I haven’t updated in…oh…a month? My goodness, how time has flown! You don’t need to hear my excuses, but I do want to assure you that I didn’t die in Atlanta, since that’s where I last left you, and that I am alive and well and cooking (although the cooking thing and I took a month off too). The important thing is that I’m back and I’m going to start slogging through my GoogleReader to catch back up with you all too. I’ve missed you! This past Sunday we celebrated Neighbor’s Day at our weekly potluck and given the beautiful weather (tall, stormy clouds punctuated by bright blue sky–no rain) we ate outside in the courtyard of the apartment building. It seemed like there were at least 20 people at some point, a great number, and definitely a smorgasbord of food and wine. Like I said, I haven’t been cooking much, but I decided to whip out the kitchen knives and have a go at a recipe. Five sweet potatoes were left from my last farmer’s market haul of 2009 and since the first farmer’s market is this weekend (which I’ll miss due to the triathlon, sigh) I decided to use ‘em up. I knew we would be grilling in the courtyard in addition to just being outside, so I decided to go with a potato salad based on sweet potatoes. A quick search came up with Mark Bittman’s Sweet Potato Salad with Black Beans and Chili Dressing and it sounded way too good to pass up. Truth be told, I didn’t change anything in the recipe besides add an extra chili or two to the dressing and it was a hit. The roasted sweet potatoes add a sweetness to the salad while the raw peppers add crunch. The dressing, with it’s acid base and chili kick is the perfect complement. And who doesn’t love black beans? I served the salad warm because I cooked it right before I took it to potluck, but after having some leftovers that were chilled, I’m a huge fan of it that way too. I know sweet potatoes aren’t the most seasonal ingredient, but this is definitely something to keep in mind for your next cookout if you’re looking to shake up the traditional items a bit. Heat oven to 400 degrees. Put sweet potatoes and onions on separate large baking sheets, drizzle with 3 tablespoons oil, toss to coat and spread out in a single layer. Sprinkle with salt and pepper. Roast, turning occasionally, until potatoes begin to brown on corners and are just tender inside, 30 to 40 minutes. Remove from oven; keep on pan until ready to mix with dressing (Note: the onions didn’t need to be roasted as long as the sweet potatoes, so I took them out first). Put chilies in a blender or mini food processor along with garlic, lime juice, remaining olive oil and a sprinkle of salt and pepper. Process until blended. (Note: at this point, adjust for taste–add more lime juice or another chili as desired). Put warm vegetables in a large bowl with beans and bell peppers; toss with dressing and parsley/cilantro. Taste and adjust seasoning if necessary. Serve warm or at room temperature, or refrigerate for up to a day. This sounds delicious! I missed your recipes…welcome back! I did worry that something happened to you in Atlanta! I don’t know how you come up so many great recipes on such a regular basis (well I guess this is a bittman one) either way it looks fantastic and perfect for my upcoming camping trip! ps it is almost tomato season, I was thinking about how I can’t wait to make the trifecta. Looks delicious. Keeps making me think, is there anything that sweet potato isn’t good with?! Welcome back! The sweet potato recipes you post are always awesome! We don’t use sweet potatoes very much over here, so this is great inspiration for me. And it looks beautiful. 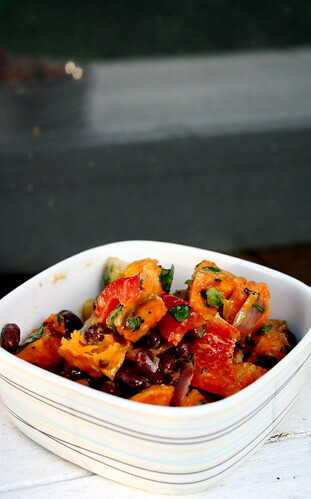 That’s a perfect recipe in a bowl – I love sweet potatoes and black beans together. And welcome back, Jes. Sometimes, it’s nice to take a break. I really like the idea of Neighbor Day. And eating good food together is a great way to celebrate! This recipe looks wonderful. My husband and I thought we were the only ones who detest cilantro—nice to know we’re not alone!